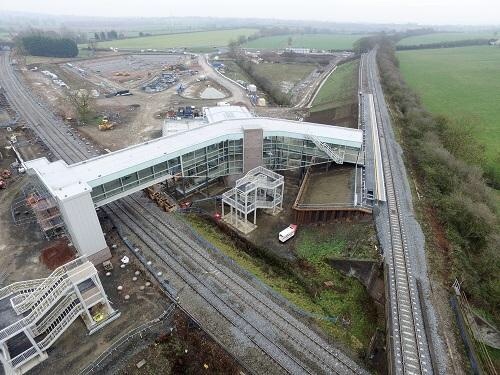 The new railway station under construction at Worcestershire Parkway is progressing well with the expectation that the station will open in the final quarter of 2019. The main station building is nearing completion and the internal fit-out works have begun. Work has started on the installation of the three, 265 metre long, platforms, each being built in sections onsite, away from the track, and then manoeuvred into place. A pedestrian bridge providing access to the platforms is in place, the new highway roundabout has been installed and opened to through traffic and work is well underway on the 500 space car park and access road.